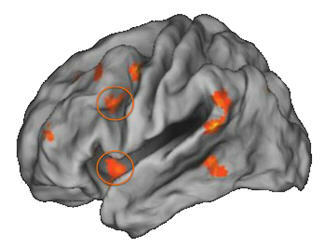 Childhood poverty impacted how much the two regions of the prefrontal cortex (as shown in orange circles) were engaged during emotion regulation. October 21, 2013—Childhood poverty and chronic stress may lead to problems regulating emotions as an adult, according to research published online in the Proceedings of the National Academy of Sciences. “Our findings suggest that the stress-burden of growing up poor may be an underlying mechanism that accounts for the relationship between poverty as a child and how well your brain works as an adult,” said Dr. K. Luan Phan, professor of psychiatry at University of Illinois at Chicago College of Medicine and senior author of the study. The study was conducted by researchers at UIC, Cornell University, University of Michigan and University of Denver. The researchers found that test subjects who had lower family incomes at age 9 exhibited, as adults, greater activity in the amygdala, an area in the brain known for its role in fear and other negative emotions. These individuals showed less activity in areas of the prefrontal cortex, an area in the brain thought to regulate negative emotion. Amygdala and prefrontal cortex dysfunction has been associated with mood disorders including depression, anxiety, impulsive aggression and substance abuse, according to the authors. Phan said it is well known that the negative effects of poverty can set up “a cascade of increasing risk factors” for children to develop physical and psychological problems as an adult. But it has not been known how childhood poverty might affect brain function, particularly in emotional regulation. The ability to regulate negative emotions can provide protection against the physical and psychological health consequences of acute and chronic stress, he said. The study examined associations between childhood poverty at age 9, exposure to chronic stressors during childhood, and neural activity in areas of the brain involved in emotional regulation at age 24. The 49 participants were part of a longitudinal study of childhood poverty. Data on family income, stressor exposures, physiological stress responses, socio-emotional development, and parent-child interactions were collected. About half the participants were from low-income families. Using functional magnetic resonance imaging, the researchers evaluated the participants’ brain activity as they performed an emotional-regulation task. Subjects were asked to try to suppress negative emotions while viewing pictures, using a cognitive coping strategy. “This serves as a brain-behavioral index of a person’s day-to-day ability to cope with stress and negative emotions as they encounter them,” Phan said. Perhaps the most important finding, Phan said, was that the amount of chronic stress from childhood through adolescence—such as substandard housing, crowding, noise, and social stressors like family turmoil, violence or family separation—determined the relationship between childhood poverty and prefrontal brain function during emotional regulation. “Effects of childhood poverty and chronic stress on emotion regulatory brain function in adulthood,” Pilyoung Kim, Gary W. Evans, Michael Angstadt, S. Shaun Ho, Chandra S. Sripada, James E. Swain, Israel Liberzon, and K. Luan Phan. PNAS 2013 ; published ahead of print October 21, 2013, doi:10.1073/pnas.1308240110. K. Luan Phan discusses research findings re: the impact of childhood poverty and stress on the adult brain. Press materials provided by University of Illinois at Chicago News Center.